Over 40 years of industry experience. 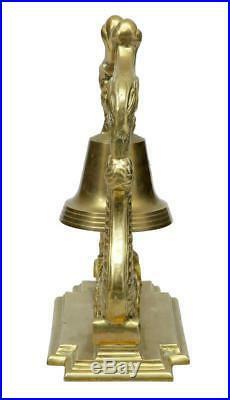 19TH CENTURY VICTORIAN BRASS DECORATIVE DINNER BELL. 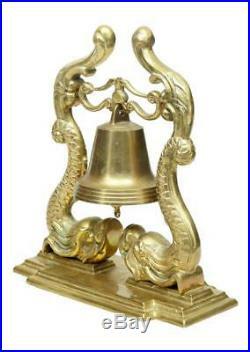 VICTORIAN DINNER BELL CIRCA 1890. 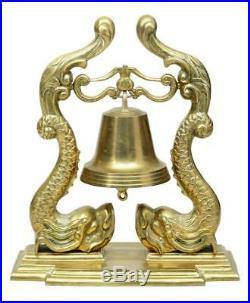 FEATURES 2 STYLISED FISH WHICH FORM THE SUSPENSION ARMS TO SUPPORT THE BELL. WOULD HAVE HAD A ROPE FROM THE BOTTOM OF THE BELL, NOW LACKING, BUT CAN BE EASILY INSTALLED. HEIGHT: 17 1/3" WIDTH: 15" DEPTH: 7 1/2. Excluding Highlands & Islands of Scotland, Northern Ireland, Isle of Man, Isles of Scilly, Jersey & Guernsey. Europe & Rest of UK. Austria, Belgium, Bulgaria, Croatia, Czech Republic, Denmark, Estonia, Finland, France, Germany, Greece, Hungary, Ireland, Italy, Latvia, Lithuania, Luxembourg, Netherlands, Poland, Portugal, Romania, Slovakia, Slovenia, Spain, Sweden. Also Highlands & Islands of Scotland, Northern Ireland, Isle of Man, Isles of Scilly, Jersey & Guernsey. The item "19TH CENTURY VICTORIAN BRASS DECORATIVE DINNER BELL" is in sale since Tuesday, January 03, 2017. This item is in the category "Antiques\Metalware\Brass". The seller is "debenhamantiques" and is located in Debenham. This item can be shipped worldwide.